Traineeships are formed through a collaborative partnership involving CMETB and local employers. It combines classroom-based learning with work based learning which is delivered in a host company, thus providing the opportunity to develop skills, knowledge and competence within a supportive working environment. Both classroom-based and work-based phase structures and durations can vary depending on the sector of industry. Employers and CMETB design all aspects of the career traineeship, from programme design and development to recruitment and delivery, therefore tailoring the programme to meet the skill needs and gaps within the industry. There are no fees for Traineeship courses. You will be entitled to Travel or Accommodation allowance, a Meal Allowance and access to the CETS Childcare scheme. If you are on a Department of Social Welfare payment you may be able to continue to receive your payments, you should check with your DSP officer. For those not in receipt of a DSP payment a bursary may be payable. This is at the discretion of the employer and is subject to satisfactory conduct and attendance. Graduates of this course have a range of laboratory skills needed to work in Laboratories or in other science related areas. Successful graduates have the opportunity to secure employment locally with Monaghan Mushrooms or other science/research laboratories. Graduates are eligible to apply through the CAO and/or the Higher Education Links Scheme for entry to year one of a range of higher certificate and degree programmes at Institutes of Technology/Universities. CMETB in conjunction with a number of industries have collaborated to develop a traineeship as an introduction to science and skills required to work in a laboratory, food production, quality control or science-related environment. The science sector plays a major role in Ireland’s economy, with many of the world’s top companies operating bases in the country. One of the reasons these companies have been attracted to Ireland is the skilled and educated young workforce. This traineeship is suitable for learners who are interested in gaining skills necessary for working in laboratories and develop a strong foundation in Science. You will learn about the science behind food-production, the procedures to be followed when working in a laboratory and use of technology in science. A substantial amount of time on this traineeship will be spent on placement in the research and development laboratories of local employer Monaghan Mushrooms. This will allow you to put your learning into practice in the work place, building your knowledge and developing your career potential. Applicants must be over 17 years of age and have completed their Leaving certificate with five O6 grades or five passes pre 2017. For mature students these requirements need not apply and applications may be considered based on a proven interest in the field. Entry is subject to aptitude test and an interview. Visit the FETCH website or complete the attached application form. Read our Privacy Notice here. As a mature student out of education for many years I was quite hesitant about returning to full time education. However, once I started the laboratory Assistance course in Monaghan Institute I was more than surprised. I found everyone at MI cordial and helpful. The tutors completely get the older students and understand what it take to get them through. The tutors are so encouraging, helpful and knowledgeable. The laboratory Assistance course is extremely interesting and I would never have guessed that I would be in MI doing something like this before I started. It really opens up new horizons. During transition year in Secondary school I had the opportunity to work in labs as part of my work experience. I found it extremely interesting and jumped at the chance to partake in the Laboratory Assistance course in Monaghan Institute. I did this in order to be more educated in what goes on in a working lab. I was not disappointed and learned a lot particularly on the work placement. I can now successfully acquire a job in a lab due to this experience and credentials obtained through this course. There are no fees for this course. You will be entitled to Travel or Accommodation allowance, a Meal Allowance and access to the CETS Childcare scheme. If you are on a Department of Social Welfare payment you may be able to continue to receive your payments, you should check with your DSP officer. For those not in receipt of a DSP payment a bursary may be payable. This is at the discretion of the employer and is subject to satisfactory conduct and attendance. CMETB in conjunction with Combilift Ltd. have collaborated to develop a traineeship to prepare learners for work with as future engineers with Combilift Ltd. Combilift plan to double their production over the next five years and have identified a need for skilled employees to deliver this objective. The aim is to combine theory and practical industry experience to provide a solid understand of Engineering before the trainee enters the workplace in Combilift Ltd.
A traineeship combines classroom-based learning with work based learning which is delivered in a host company thus providing the opportunity to develop skills, knowledge and competence within a supportive working environment. Trainees will complete 11 weeks in industry working with Combilift Ltd. and 27 weeks studying in Monaghan Institute. Work Placement is spread across the year in blocks of two/three weeks. Applicants must be over 17 years of age and have completed their Leaving certificate with five O6 grades or five passes pre 2017 (preferably to include Mathematics, Engineering or another technical subject). For mature students these requirements need not apply and applications may be considered based on a proven interest in Engineering. Entry is subject to aptitude test and an interview. Visit the FETCH website or complete the application form and return to training@cmetb.ie. Read our Privacy Notice here. When Daniel Soden left school, he was keen to combine college classes with hands-on experience that could lead to concrete career opportunities in the engineering manufacturing sector. 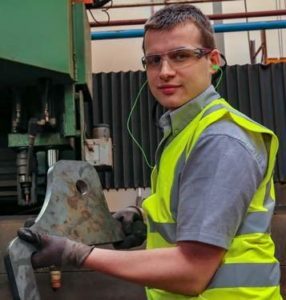 The former pupil of The Royal School, Cavan started an OEM (Original Equipment Manufacturer) Traineeship with Combilift, Co Monaghan, the largest global manufacturer of forklifts. The traineeship is run by Cavan and Monaghan Education and Training Board (CMETB) at Monaghan Institute. The one-year, Level 5 programme is an example of the growing trend towards a work-based learning approach to qualifications. This one involves 11 weeks in Combilift, in blocks of two/three weeks, and 27 weeks in college. Combilift trainees are paid €100 a week for the nine months of the course. 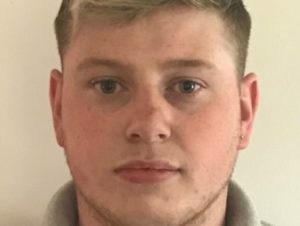 Daniel, who hails from Scotstown, Co Monaghan, covered topics and skills including engineering and manufacturing processes, fabrication, welding, electrics, electronics and health and safety. Graduates may progress to employment in Combilift Ltd. or to an Apprenticeship in Engineering Technology. The course offers practical skills in machining, fitting, control systems, auto electrics, CAD and hydraulics. Holders of a QQI Level 5 Engineering Technology award have the opportunity to progress to third level degree programmes at Universities/Institutes of Technology through the Higher Education Links Scheme. CMETB in conjunction with Entekra™ have collaborated to develop a Traineeship as an introduction to Architectural Technology and Computer Aided Design. Entekra™ is a design, engineering and manufacturing company that provides a fully integrated off-site solution (FIOSS™) for both residential and commercial construction. This Traineeship provides a variety of modules which relate to the design/drawing/CAD/IT skills required within the construction sector where students intend to seek employment and will enable students to make an immediate contribution in employment. Learners will gain the skills, knowledge and competencies to work autonomously and under supervision in a range of computer aided design and or drawing office contexts and/or to progress to further and or higher education and training. For mature students these requirements need not apply and applications may be considered based on a proven interest in Architectural Technology and Computer Aided Design. There are no fees for this course. You may be entitled to travel or accommodation allowance, a meal allowance and access to the CETS Childcare Scheme. If you are in receipt of a Department of Employment Affairs and Social Protection (DEASP) payment you may be able to continue with these payments, please check with your DEASP Officer. For those in receipt of a DEASP payment, you may be entitled to the Entekra bursary. On successful completion of the traineeship and QQI Award, you can apply for employment opportunities within Entekra. Alternatively, students may decide to travel and work abroad. The QQI Level 5 Digital Marketing Traineeship will operate in conjunction with a number of employers in Cavan and Monaghan and provides a competitive edge in terms of gaining and retaining employment. Learners will gain the skills, knowledge and competencies to work autonomously and under supervision in a range of digital marketing contexts and/or to progress to further and or higher education and training. For mature students these requirements need not apply and applications may be considered based on a proven interest in the field of Digital Marketing. Entry is subject to an aptitude test and an interview. If you are in receipt of a Department of Employment Affairs and Social Protection (DEASP) payment you may be able to continue with these payments, please check with your DEASP Officer. On successful completion of the traineeship and QQI Award you can apply for employment opportunities within the host companies or related job roles for example in ICT, marketing, ebusiness, social media, web design, content management, graphic design and creative media.